All Biomechanics courses are taught by our faculty and staff. BMCH 1000 Introduction to Biomechanics (3) This is an introductory course in biomechanics that provides a brief history, an orientation to the profession, and explores the current trends and problems and their implications for the discipline. This course is a Social Science General Education Course. BMCH 1100 Ethics of Scientific Research (3) This course is a survey of the main ethical issues in scientific research. This course is a Humanities and Fine Arts General Education Course. BMCH 2200 Analytical Methods in Biomechanics (3) Through this course, students will learn the fundamentals of programming and problem solving for biomechanics with Matlab and Excel. Students will also learn the attributes and uses of other programming languages. BMCH 2400 Human Physiology and Anatomy I (4) The study of the structure and function of the systems of the body with an emphasis on the skeletal, muscular, cardiovascular, and respiratory systems. BMCH 2500 Human Physiology and Anatomy II (4) The study of the structure and function of the systems of the body with an emphasis on the nervous system, special senses, digestive system, endocrine system and metabolism, as well as body temperature regulation, the lymphatic system, and the urinary system. BMCH 3000 Biomechanical Statics & Dynamics (3) This course is the study and exploration of the effect of forces on biological systems, mainly the human body, during static and dynamic situations. BMCH 4100 Bioinspired Robotics (3) The goal of the course is to involve students in an interdisciplinary vision of biomechanics, biology, engineering, and architecture by learning the principles of how humans, other animals, and plants function in their environment. These design principles from nature can be translated into novel devices and structures. BMCH 4200 Methods in Biomechanics I (3) In this course students learn about the methods and equipment used in biomechanics as well as the analysis of data collected from those methods. Course experiences include both lecture and lab based learning. BMCH 4210 Methods in Biomechanics II (3) In this course students learn about advanced methods and equipment used in biomechanics, as well as the analysis of data collected from those methods. Course experiences include both lecture and lab based learning. This course builds on the experience gained in BMCH 4200, Methods in Biomechanics I.
BMCH 4630 Biomechanics (3) A study of the forces that act on a human body and the effects that they produce. BMCH 4640 Orthopedic Biomechanics (3) Orthopedic Biomechanics focuses on the use of biomechanical principles and scientific methods to address clinical questions that are of particular interest to professionals such as orthopedic surgeons, physical therapists, rehabilitation specialists, and others. BMCH 4650 Neuromechanics of Human Movement (3) A study of basic principles of neural process as they relate to human voluntary movement. Applications of neural and mechanical principles through observations and assessment of movement, from learning to performance, as well as development. BMCH 4980 Capstone Design in Biomechanics I (3) Teams of senior-level students work with sponsors and faculty advisers to develop solutions to real problems in the biomechanics and health-care related fields. BMCH 4990 Capstone Design in Biomechanics II (3) Teams of senior-level students work with sponsors and faculty advisers to develop solutions to real problems in the biomechanics and health-care related fields. The Capstone Design II course is intended to further develop and validate the concept direction chosen during Capstone Design I by designing the specific details necessary to build and test a proof-of-concept prototype. BMCH 8000 Seminar in Biomechanics (0) Required non-credit course for graduate students in biomechanics. Intended to familiarize the graduate student with current ongoing biomechanical research at UNO and other institutions. The seminar will additionally include topics focusing on professional development, job and educational opportunities, and biomechanical methodologies. BMCH 8030/9031 Biostatistics in Biomechanics I (3) The focus of the course is to prepare students to understand and apply research and biostatistical methods needed in the design and analysis of biomechanical investigations. The major topics to be covered include research design and multiple linear regression. BMCH 8100/9101 Nonlinear Analysis for Movement Sciences (3) The purpose of this workshop is to introduce research scientists, clinicians, and students to a variety of nonlinear methods for the analysis of biological time series data. Participants will learn how to use nonlinear methods to analyze real biological data. Instructors will use class discussions and hands-on practice to facilitate understanding of the material covered in the lectures. This workshop is an introduction to nonlinear analysis methods; participants with varied backgrounds are welcomed. Prereq: College algebra, basic trigonometry, basic statistics and basic computer skills. BMCH 8200/9201 Matlab for Movement Sciences (3) Introduction to MatLab software, plotting data, spectral analysis and the Fourier transform, data smoothing, and image analysis of biomechanics data. All topics will be implemented using MatLab. BMCH 8400/9401 Motor Learning I (3) The focus of the course is on recent theories of how movements are acquired and performed, and on factors that have implications for motor learning throughout the life span. BMCH 8410/9411 Motor Control I (3) The focus of the course is to explore the study of the conditions and factors that influence the control and performance of motor skills from both neurophysiological and psychobiological perspectives. BMCH 8420/9421 Motor Development I (3) This course focuses on the study of motor development, the processes that underlie this development and the factors that influence it. Students will gain an understanding of the major theoretical perspectives of motor development across the life span with special emphasis given in child development. BMCH 8450/9451 Advanced Biomechanics (3) This course will address the biomechanical basis of human performance including mechanical analysis of human gait, fundamental movement patterns, and techniques used for collecting biomechanical data. BMCH 8900 Independent Research in Biomechanics (1-6) In this course individuals or groups will conduct research projects for the study and analysis of biomechanical topics. BMCH 8910/9911 Independent Study in Biomechanics (1-6) This is a variable credit course designed for graduate students in Biomechanics who would benefit from independent reading assignments and problems. Independent study enables individual students or a small group of students to focus on topics typically not explored in other offerings or to explore topics currently offered in further depth. BMCH 8990 Thesis in Biomechanics (1-6) A research project, designed and executed under the supervision of the chair and approval by members of the graduate student's advisory committee. In this project the student will develop skills in research design, research conduct, data analysis, and reporting. The final product of this course will be an original thesis of independent scientific investigation. 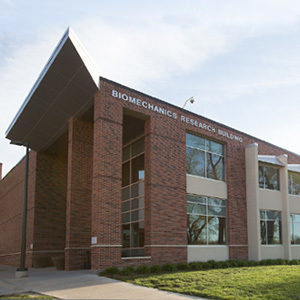 BMCH 9040 Biostatistics in Biomechanics II (3) The focus of the course is to prepare graduate students to understand and apply advanced research and biostatistical methods needed in the design and analysis of biomechanical investigations. The major topics to be covered include advanced research design and the general linear model. This course builds upon basic research design and linear regression learned in Biostatistics in Biomechanics I for the application in single factor and multi-facotr experimental analyses. BMCH 9460 Advanced Biomechanics II (3) A comprehensive and advanced detailed investigation of the biomechanics of motor performance in special populations such as stroke, Parkinsons disease, and amputees. Includes advanced study of the mechanical analysis of motor skills and movement patterns and the research techniques for collecting and interpreting biomechanical data. Detailed lectures will cover etiology of such special populations with a focus on the endpoint movement disorders. BMCH 9500 Motor Learning II (3) The focus of the course is to further explore the study of the conditions and factors that influence the learning and performance of motor skills. The purpose of this course is to provide a comprehensive and intensive coverage of the experimental literature on human motor learning. In addition, there will be a more in-depth coverage of selected issues. BMCH 9510 Motor Control II (3) The focus of the course is to further explore the study of the conditions and factors that influence the control and performance of motor skills. The purpose of this course is to provide a comprehensive and intensive coverage of the experimental literature on human motor control. In addition, there will be a more in-depth coverage of selected issues. BMCH 9910 Doctoral Seminar (3) The major goal of this course is to teach the graduate student how to write manuscripts, grants and be an effective academician with strong ethics. The outcome of this course is for the student to produce a manuscript based on data acquired in the laboratory from the ideas developed in the seminar or submit a grant that will support the research ideas developed in at least one semester. The material covered is intended to equip students with the skills necessary to be successful in their academic careers with emphasis given on writing scientific papers. BMCH 9990 Dissertation (1-15) This course provides doctoral candidates in Exercise Science with a process to complete a dissertation research plan. The course learning activities will focus on the completion of a candidates dissertation. The course is designed to allow advanced doctoral candidates to demonstrate technical mastery of the discipline and to advance knowledge by completing an investigation.